Morgan Point Lighthouse in Groton, Conn.
West side of the mouth of the Mystic River. Privately Owned. Silas Spicer, who became keeper in the 1850's, observed a burning vessel offshore. He quickly rowed to the boat in flames and rescued the captain with his wife and child, bringing them safely back to the lighthouse. Morgan Point had two women who were lighthouse Keepers when their husbands passed away. One of the female Keepers, Frances McDonald, who served from 1869 to 1871, passed her duties to her brother, Thaddeus Pecor, who went on to become one of the longest-serving keepers in history, with 48 years of service until 1919 when he retired at the age of 75. In Noank, visit the Noank Historical Society Museum exhibiting maritime artifacts including early photos of Morgan Point. Mystic Seaport is also nearby, and is an outdoor recreated 19th century village and educational maritime museum, with artifacts, exhibits, a working preservation shipyard, and four National Historic Landmark vessels. A replica lighthouse that is constructed familiar to Brant Point light on Nantucket Island in Massachusetts is also found there. The Mystic Aquarium provides educational and up close exhibits of marine life that include sharks, jelly fish, eels, and barracuda. Boat cruises mentioned below offer many types of cruises. While some may offer specific lighthouse cruises, some will pass by specific lighthouses as part of charters, narrated wildlife and historic tours, ferrying passengers, whale watching, fishing tours and other types of excursions. 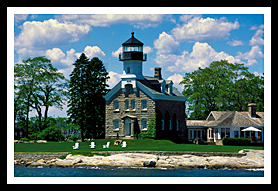 My 300-page book, Lighthouses and Coastal Attractions of Southern New England: Connecticut, Rhode Island, and Massachusetts, provides special human interest stories from each of the 92 lighthouses, along with plenty of indoor and outdoor coastal attractions and tours you can explore. ©Allan Wood Photography, not for commercial use, personal use only. Do not reproduce without permission. All rights reserved. Privacy & Disclaimer Statement.